On the occasion of this festival sisters generally apply tilak to the forehead of their brothers, tie the sacred thread called Rakhi to the wrist of their brothers and do arati and pray for their good health & long life. This thread, which represents love and sublime sentiments, is called the ‘Raksha Bandhan’ means ‘a bond of protection’. The brother in return offers a gift to his sister and vows to look after her. Rakhi Celebration ( knot of protection ) in India stands for the sacred relation between a brother and a sister. It is the special festival of brother and sister. We offer online gifting experience on the special occasion of Raksha Bandhan, people of all age group can realize the actual value of having their own brother and sister in their life. The bond of love between a brother and a sister is one of the the most beautiful relation on this earth. This festival brings in the feeling of strong and divine relationship among siblings. Rakhi celebration strengthens the affectionate relationship and love among them. 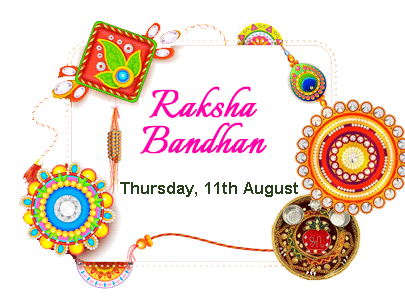 On this auspicious day, sisters tie a Rakhi / Raksha Bandhan around the wrist of their brothers and wish them to remain free from any evil influence throughout their lives. In turn, brothers also promise to protect their sisters from any odd situation at any cost. Apt occasion, for online gifts and sweets for your dear ones. According to the Indian tradition, the Rakhis ( Holy Thread ) and sweets ( Methai ) are prepared long before the Shravana Purnima. , the family members get ready for the rituals early in the morning. They take a bath to purify mind and body before starting preparations. Sisters prepare the puja thali which consists of roli, tikka, Rakhi threads, rice, aggarbattis (incense sticks), diyas and sweets. After offering the rituals to the deities of the family, the sister perform aarti of their brothers and ties Rakhi on their wrist. and put kumkum powder on the forehead of their brother and offer sweets. Turns out, Raksha Bandhan wasn't just meant as a symbol of sibling love, as is illustrated by the story of Indra and Indrani. During a war between Gods and demons, wherein Indra was losing to King Bali, Indra's wife Indrani prayed to Lord Vishnu, who gave her a holy thread which she tied around Indra's wrist. Blessed with its powers, Indra won the war and the thread became his protection against any evil. It's said that after Lord Krishna hurt his index finger while hurling the Sudharshan Chakra at Shishupala, Draupadi tore her saree immediately and tied it around Krishna's finger to prevent it from bleeding. Touched by her unconditional love, Krishna took the mantle of Draupadi's care and protection upon himself. Queen Kunti is said to have tied a sacred thread as a measure of protection, on the wrist of her grandson, Abhimanyu--the son of Subhadra and Arjun--during the battle of Mahabharata. Lord Vishnu disguising himself as the doorman of King Bali--the grandson of Vishnu's ardent devotee Prahlada--Goddess Lakshmi became restless because of his absence in Vaikuntha (their abode). She came to earth in the guise of a Brahmin woman and told Bali, the story of her husband having gone away for some work, due to which she requested for shelter from the King. Bali not only gave her a place to stay, but also took care of her. It's said that on the full moon day (Purnima) of the Shravana month, she tied a thread around Bali's wrist with prayers for his protection and happiness. Touched by her affection, Bali granted her a wish. She requested him to free her husband, the gatekeeper. The incident had Bali confused as he couldn't envision the lady as the doorman's wife. It's then that both Lord Vishnu and Goddess Lakshmi revealed their true selves to the King, who urged Vishnu to return with the Goddess to Vaikuntha. The festival is also known Baleva. On seeing Lord Ganesha celebrate Rakhi with his sister, his sons Shubh and Labh started insisting upon a sister, leading to the creation of Santoshi Maa, from the flames that emerged from his consorts, Riddhi and Siddhi. During Alexander the Great's invasion of India in 326 BCE, his wife Roxana sent a sacred thread to Porus, requesting him not to harm her husband in battle. It's believed that on the battlefield, the thread on his wrist was a constant reminder of his promise to Roxana, preventing him from attacking Alexander directly. Rani Karnavati--the widowed queen of Chittor--is said to have sent a rakhi to Mughal Emperor Humayun, upon the looming threat of invasion from the Sultan of Gujarat, Bahadur Shah. Though Humayun turned up too late, it's no secret that he honored the sentiment with which it was sent. Yamuna was the sister of Lord Yama, the God of death. On every "Shravan Purnima", Yamuna used to tie a sacred thread (Rakhi) to Lord Yama. Since then, it has become a tradition for sisters to tie Rakhi to their brothers on this day. In return, the brothers bestow blessings on their sisters and promise to protect them all the problems and difficulties that they might ever face. Raksha Bandhan is a festival which ritually celebrates the love and duty between brothers and their sisters. India Gifts Mall brings out a good collection of Rakhi for deliveries in India & abroad. Send your love & care through our gifts which can be delivered worldwide. We select these rakhis from direct manufacturers in India. We personally visit each and every manufacturer and select the best designs from there stores. We also design our own rakhi and and ask them to manufacturer them. You will find best rakhi selection in our store. Auspicious is a positive word, that speaks to success and good fortune. It has two definitions. It can means that something shows or suggest that future success is likely, or most likely coming. When this definition of auspicious is used, it is always looking towards the future. The literal meaning of Mauli in Sanskrit is ‘crown’, which means above all. Well, Mauli is a sanctified thread which is also known as ‘Kalava’. It is a red and yellow combination cotton thread. 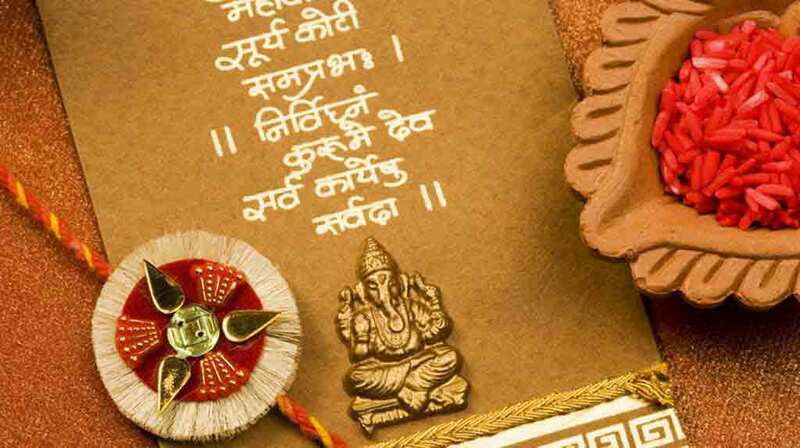 Mauli holds tremendous significance in Hindu culture since ancient times. According to the ancient Hindu scriptures, it is said that Lord Vishnu’s incarnation Vamana tied the ‘Raksha (protection) Dhaga (Thread)’ on the wrist of King Bali to grant him with the boon of immortality. Since then, the ritual of tying Mauli has been practiced by the Hindu sect. Every Hindu ritual has a story and significance to back it. There is a specific way of tying Mauli Rakhi. Beads are small pieces of coloured glass, wood, or plastic with a hole through the middle. Beads are often put together on a piece of string or wire to make jewellery or Rakhi. If your love for your brother is true, the happiness of your brother will be yours too. To see him more happy and gay you can gift this American Diamonds and other stone work rakhi. These rakhi are designed keeping in mind of most fancy and rich looking, these rakhi can also be used as a bracelet after the occasion. Rudraksha is an auspicious bead revered by Hindus and is believed to be a part of Lord Shiva, the Hindu deity. Rudraksha can make the whole family live together in peace and harmony. Rudraksha is best known for its biomedical properties and in controlling stress, hypertension and blood pressure. Rudraksha help increase Self power and invoke Self love. They also enhance the Charisma of the wearer. One of the most complex crafts, the process of Meenakari remains the same as it was 500 years ago! Even today, a Meenakari artefact goes through the same assembly line of craftsmen as it used to go through hundreds of years ago. The process starts with the designer (naquash), then goes to the goldsmith (sonar). It is then passed on to the engraver (kalamkar) who engraves the design, then the enamelist (meenakar) applies the colour. The artefact then goes to the polisher (ghotnawala), then the stone-setter (jadia), and finally it goes to the stringer (patua) for the final touches. We have wide range of Rakhi Puja Thalis like Marbel Puja Thali, Brass Puja Thali, Cane Poja Thali, Steel Puja Thali etc. The pious occasion of Raksha Bandhan has arrived for sisters to send their innumerable wishes to beloved brothers. India Gifts Mall offers designer collection of Rakhi and its byproducts such as exclusive Rakhi Thalis, Rakhi Lumba sets, family rakhi, kiddy rakhis and many more unique products for delivery in Australia. A love between a brother and a sister is one of the deepest and noblest of human emotions. No matter how far siblings are from each other, India Gifts Mall offers gigantic and exquisite collection of designer Rakhis, Rakhi combos, Rakhi hampers & Rakhi thalis for delivery in USA. Raksha Bandhan encompasses the warmth and love shared between the siblings. No matter how far siblings are from each other, but India Gifts Mall take this pride to send your innumerable blessings and wishes to Canada with our wide and exotic range of Rakhis, Rakhi combos, Rakhi hampers & Rakhi thalis. Rakhi Utsav was first popularized by Rabindranath Tagore to promote the feeling of unification and solidarity to all members of society. Raksha Bandhan is now considered as a day to celebrate the solemn relation of a brother and a sister. No matter how farthest distances between siblings, our Rakhi will always reach on time, to be tied on the wrist of your loving brother with the heartwarming wishes.